Dashing French pirate Jean-Philippe Beauvisage revels in a life of complete freedom...until the night at a ball in Georgian London, when a Russian beauty quietly steals his heart. Heartbroken Antonia Varyshkova, who has lost her parents and her home in a St. Petersburg fire, stops in London en route to a new life with her brother in America. When her arrogant ship's captain, Tobias Ormond, insists that she attend a ball with him, Antonia reluctantly agrees. 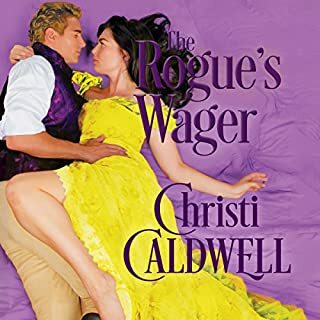 Dashing and dangerous Andre Raveneau is the Revolutionary War's most reckless privateer captain when Devon Lindsay stows away aboard his ship after her Connecticut town has been burned by the British. Raveneau sardonically agrees to deliver her to her childhood sweetheart in Virginia but doesn't count on his own potent attraction to the enchanting, courageous Devon. 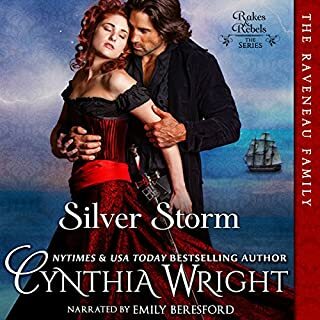 Through high adventure, swashbuckling sea battles, and the colorful history of America's revolution, the couple battles the fiery passion that binds them together. My all-time favorite novel, now as an Audiobook! Fiona MacLeod has never left the Isle of Skye, except in the pages of books. However, everything changes when her mother makes a deathbed request that Fi travel to Falkland Palace and experience the royal court. Across the ocean in Europe, architect Christophe de St. Briac, a rising star among the artistic builders of the Renaissance, has his pick of women to warm his bed - until King François I pressures him to accept a project at Scotland’s Falkland Palace. Although Fiona and Christophe are from different worlds, they soon find their passionate souls have everything in common. Lord Robert Dennington, the Marquess of Westfield, has long reveled in the freedom afforded him as the ducal heir. He knows he must someday do right by the Somerset line, but he's in no hurry to give up his carefree existence.Helena Banbury is a bookkeeper in a gentleman's gambling club, adept at analyzing numbers and accounts but helpless for lack of influence. Turned out by his father after a tragic scandal, Lord Michael Knightly has grown into a powerful, but self-made man. With the whispers and stares that still follow him, he's been shut out of respectable society. He would rather be anywhere but London. Then he meets Lady Aldora, a young woman who mistakes him for his brother, the Marquess of St. James. Life for Victoria Lacey should be perfect. And it is - perfectly boring. Agree to marry a lord who has yet to inspire a single, solitary tingle? Why, of course. Smile as though this is not the thousandth time he's mentioned hounds and hunting? It's all in a day's work for the oh-so-proper sister of the Duke of Blackmore. Surely no one would suspect her secret longing for heart-racing, head-spinning passion. Except, perhaps, a dark stranger...on a terrace...at a ball where she should definitely not be kissing a man she has only just met. Ian Mackintosh and his bride, Rose, return to McLaren Lands to rebuild all that was destroyed by the previous laird. Believing bad times and evil men are behind them, they've let their guard down. Ian's world is turned upside down one cold winter's night when Rose is kidnapped. Thomas Mardouet, seigneur de St. Briac, is a man with a perfect life - bold, witty, and splendid to behold, he is the King of France's trusted knight. But the day that captivating Aimée de Fleurance appears in the woods to interrupt a hunt, St. Briac's life is turned on end. After years of playing the rake to hide a dark family secret, the Duke of Aversley feels tainted beyond redemption and cynical beyond repair. Never does he imagine hope will come in the form of a quirky, quick-witted lady determined to win the heart of another gentleman. Thanks to a painfully awkward past, Lady Amelia De Vere long ago relinquished the notion she was a flower that had yet to blossom. The enchanting story of Caroline's daughter! Grey St. James is a winner of the K.I.S.S. Hero Award from Romantic Times. 1814: Grey St. James has escaped from Napoleon's prison on the rocky isle of Mont St. Michel. Desperate and dangerous, he is a far cry from the rakish nobleman who broke hearts in Regency London. In her uncle Nicholai's French chateau, Natalya Beauvisage is writing a novel. At 26, she is beautiful but hardly marriageable, for she is devoted to being an author. However, when a potently attractive stranger appears to hold her at knifepoint, Natalya thrills to a flesh-and-blood man. Reunite with the couples from Caroline, Touch the Sun, and Spring Fires in this enchanting & witty historical romance! I first met Cynthia Wright's NATALYA in my trade paperback copy, which I was very excited about because I was able to get a matching copy of her mother's story, CAROLINE. (These little details are very important to us obsessive readers.) 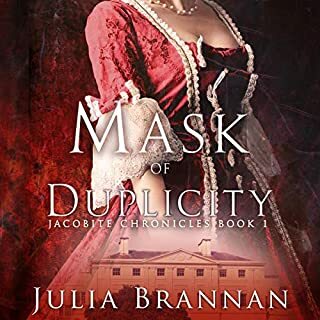 I then got to revisit Natalya Beauvisage in her spiffy new ebook format as HER DANGEROUS VISCOUNT. And now I was able to pair another reread of the story with a listen to the eaudio format. Twenty-six year-old Natalya, daughter of Alec and Caro Beauvisage, has been living in France for the past six years as an authoress in her Uncle Nicholai's Chateau du Soleil. While she loves France and loves writing, she is starting to miss her family and home in Philadelphia. Grey St. James has escaped from prison and makes his way to Chateau du Soleil for assistance in getting back to England. Since Grey held Natalya at knife point during their first meeting, needless to say she is not fond of him. But it seems that they can help each other get to England and then go on to Philadelphia. As to be expected, Cynthia Wright blends humor and meticulous details into the story. This historical period is the War of 1812/Napoleonic Wars and the reader gets a strong feeling of time and place. 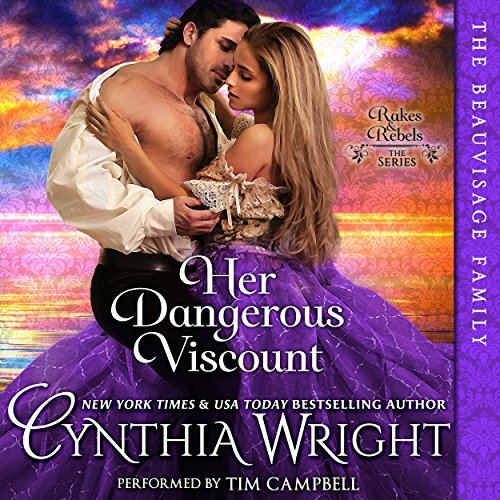 Whether it is your first read/listen or your fifth, HER DANGEROUS VISCOUNT is an engrossing story, giving you a chance to revisit old friends from other Rakes and Rebels books and cheer on Natalya and Grey. 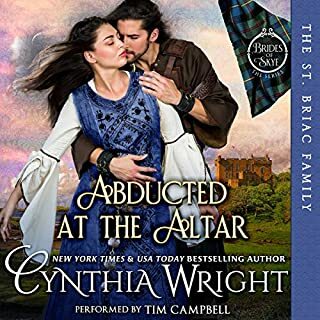 Cynthia Wright’s storytelling paired with Tim Campbell’s narration are both engaging and satisfying. 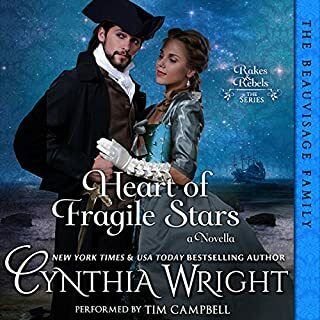 I now find that I cannot resist Tim Campbell reading Cynthia Wright’s books. To say I love his voice would not be accurate. The correct version of that sentence is that I love his voiceS. Campbell makes each character very distinct and gives him/her their own voice. Several times I had to remind myself that it was only one narrator! As a librarian, I am often helping customers who will actually ask for audiobooks by the narrator as opposed to the author and are willing to listen to anything that narrator reads. I now put Tim Campbell in that category. And when he is reading a book by one of my favorite authors, it is a no-brainer—a must-listen! Note: I was given a free copy of the eaudiobook in exchange for an honest review. Story okay but pretty simplistic and very little "danger". Not much intrigue and everything ends quickly and easy. Nice love story. Really only reason to read is if you are interested in the series. Seems to only be a vehicle for talking about all the other books. Just when I believe you have written the best book, I find another one that I love more. Her Dangerous Viscount was wonderful and I wish it wasn't the last lin this series.